Richard Cauldwell: Phonology for Listening. Teaching the Stream of Speech. Speech in Action. Birmingham, UK 2013. “Ying’s dilemma“: Ying from Sinagpore says she can’t catch the words she knows, as she doesn’t understand how their sound shapes change in the middle of sentences, squeezed together, especially in spontaneous speech. Approaching the problem from the standard pronunciation syllabus doesn’t resolve the problem, Cauldwell says, because the “careful speech model” that underlies that syllabus treats language as “a correct, tidy, steady-speed, rule-governed phenomenon,” with a limited set of sounds and rules for sentence types and connected speech phenomena, “optimised for clear pronunciation.” (p. 4) So while it may be easy to use such a syllabus to teach, it doesn’t help learners acquire the listening skills they need. Cauldwell explains the challenge using three metaphors: Beyond the “greenhouse” of the classroom, and outside the “garden” of careful speech, the student of English needs to deal with the unruly “jungle” of spontaneous speech (p. 260). That’s the messy, real world that we need to prepare our students to handle. Cauldwell’s solution is to take a comprehensive approach, “teaching learners to decode the sound substance of the stream of speech.” (p.1) He lays out a “window on speech framework”, a toolkit for contrasting the clearly pronounced “citation form” with the changed sound shapes in spontaneous speech. The framework is built around the speaker-defined speech unit, rather than the grammar-defined sentence unit, as it reflects “the moment-by-moment choices that speakers make as they communicate.” (p.5) Speech units are defined as multi-word rhythmic sections with prominent and non-prominent syllables, steps up and down in pitch, and tone glides (up, down and level). Cauldwell’s special focus is on the “squeeze zones” of non-prominent syllables contained in speech units, and he highlights the compression of whole word groups. Part 1 (Chapters 1-5) presents the “window on speech” framework, expanding on the work of David Brazil, Richard Bradford, Martin Hewings and others to introduce notation techniques to describe the precise sound effects of squeezing. Part 2 (Chapters 6-10) describes the sound substance of the stream of speech, including shifts in stress. This includes an interesting discussion on syllable timing, i.e. how speakers of an L1 such as French will retain syllable timing when they use English. Part 3 (Chapters 11-15) studies the range of factors influencing the stream of sound, including accents (i.e. Britain, Ireland, North America, and Global including English as a Lingua Franca), as well as how identity, emotion and attitude influence speech. Part 4 (Chapters 16-20) suggests learner activities for spontaneous speech listening, in both low-tech (teacher and peer listening, recordings) and high-tech (recordings and apps) contexts. Overall, the exercises raise awareness for getting past the “decoding gap”. The key requirement is “letting go of the careful speech model”. While Cauldwell uses sample recordings throughout the book to raise awareness for the specific sound shapes, with careful listening/analyzing and preparing/performing tasks, Part 4 goes the extra step of explaining how to work with the material. First, students or the teacher create a “greenhouse” version of the phrase, i.e. every word is spoken very clearly. Then they create a slightly messy “garden” version with stress being dictated by the speaker’s personal intended meaning. After that, pairs speak in unison to contrast the two different versions (then performing before the class). In the recoding, this sounds quite disjointed. This is a rather general awareness-raising exercise that could be used to introduce the overall approach, and to practice noting down a phrase in its different sound shapes. Finally, Cauldwell suggests using Audacity or another digital editor to record and study the wave shape of sounds, and Audio Notetaker to listen to, analyze and edit the chunks of a given piece of audio. 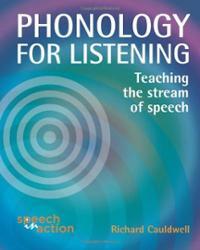 Overall, Phonology for Listening represents an original and enormously practical approach to teaching an essential language skill that needs attention, and is clearly in need of improvement among many of our students. Highly recommended. You can access the Phonology for Listening soundfiles here and here. Richard Cauldwell’s recorded workshop “Jungle Listening” is available online on the British Council website. His iPad app “Hot Listening, Cool Speech“, available on iTunes, won the digital innovations award at the 2013 ELTons. Thanks to Flula Borg for deconstructing idioms and also for getting right in there with prejudices against Germans – and just dealing with them. I really like Flula being playful and silly with My Drunk Kitchen presenter Hannah Hart.